Kenji Koiso is your typical teenage misfit. He's good at maths, bad with girls, and spends most of his time hanging out in the all-powerful, online community known as OZ. His second life is the only life he has until the hottest girl at school, Natsuki Shinhara, hijacks him for a starring role as a fake fiancé at a family reunion to celebrate her grandmother's birthday. Things only get stranger from there. A late-night email containing a cryptic mathematical riddle leads to the unleashing of a rogue Artificial Intelligence agent intent on using the virtual word of OZ to destroy the real world. As true Armageddon looms on the horizon, Kenji and Natsuki's family must set aside their differences and band together to save the worlds they inhabit, both real and virtual. From Mamoru Hosoda, the visionary director of The Girl Who Leapt Through Time, Summer Wars was described by Jonathan Clements (author of Schoolgirl Milky Crisis: Adventures In The Anime And Manga Trade) as "Ghost In The Shell for the Facebook generation," by Tom Smith from Neo as a "contemporary romance for the Facebook generation... [that] rivals the work of Ghibli" and by Anime News Network as "a triumph... incredibly entertaining and intriguingly intelligent... pretty much perfect." 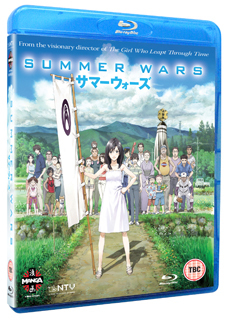 Summer Wars was the winner of the 2010 Japan Academy Prize for Animation of the Year, the 2010 Japan Media Arts Festival's Animation Division Grand Prize, the Anaheim International Film Festival's Audience Award for Best Animated Feature and was nominated for the prestigious Golden Leopard award at the Locarno International Film Festival.